I was very pleased to have the opportunity to sample some beautiful make up tools from legendary brand Japonesque. I’ve got a few things to review, but I thought I’d start out with my favourite thing. The Japonesque Touch Up Tubes are available in pink, silver, red and black. 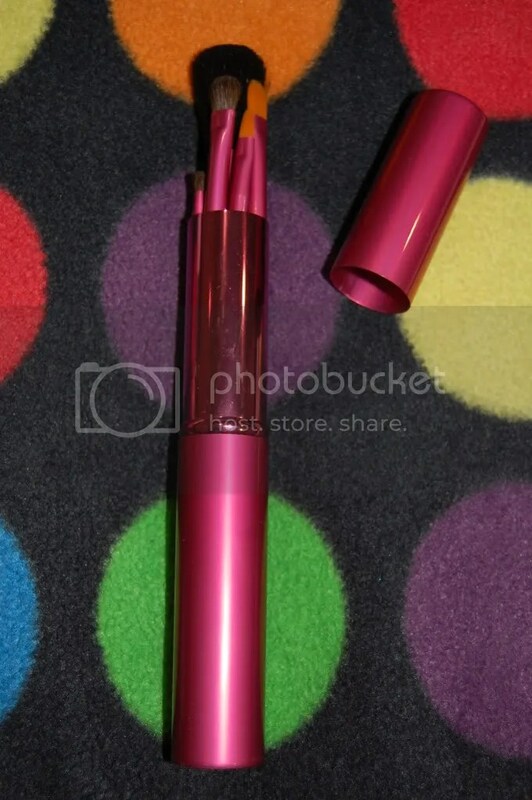 I got a pink Touch Up Tube, isn’t it shiny & pretty? The set comes with five perfectly travel sized essential make up brushes including: foundation brush, powder/blusher brush, lip brush and two eye detailer brushes. The handles are lovely matte black which gives them a professional, quality look to them. I think the foundation brush is quite small for what it is, I wouldn’t like to use it for a full face, but would be ideal for touch ups and concealer, which is what it’s designed for! I’ve loved using the eye detailer brushes today, the little one is just what I’ve been looking for, great for precise lines and adding colour to the crease. It’s really soft too and hold pigment really well. Here’s a daytime look I did using the eye brushes from this set. All of the make up I’m wearing today is from Youngblood Mineral Cosmetics. You can see how precise I’ve been able to be on the brown on the crease, it’s just what I’ve been looking to create but I was lacking the right brush. So thank you so much Japonesque for sending me the perfect eyebrush! Overall, I’m in love with the Touch Up Tube, which you can pick up from John Lewis for the bargainous price of Â£16.50. It would make a great gift and a perfect addition to your desk drawer or hand bag for on the go touching up. Japonesque also offer a eye touch up tube, which I will be reviewing at a later date, when I have the time to do something a bit moreÂ adventurousÂ with my make up. What do you think? Have you tried Japonesque tools? Tweet me @JayneJRead or comment below via Disqus.